I miss Goosebumps, Animorphs, and the other not-so-thick novels yet very interesting, somewhat creepy, and unfamiliar stories. When my friend told me about this series, I had never imagined it could be so interesting. It has an interesting plot, unique characters, and there's always a surprise at the end of each book. Do you know it? I started to read book two, The Vampire Assistant, and couldn't stop to read the next one. I was getting used to Darren Shan's story style (you know what I mean). As a conclusion, Cirque du Freak series=Interesting, creepy, surprising, and you have to try to read it. The movie came up and I can't resist to watch it. 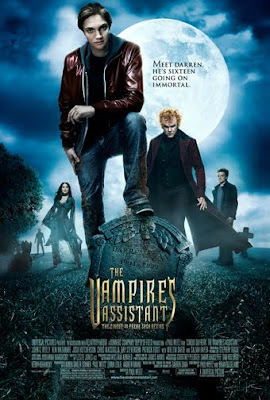 The title is The Vampire Assistant. Just like the other book-based-movie, we can't expect what we want. But this one is very dissapointing. The main character should be about 12 years old, but in the movie, Darren and Steve looked so much older, may be high school student. It's not a spoiler alert. I just suggest you to read the book, but don't watch the movie before you complete the series. Some secrets which are going to be revealed in the very next book are somewhat showed up in the movie. I don't know whether there will be Cirque du Freak 2, but how they manage the whole plot if they messed up in the first? The story in this movie is a slight bit different from the book. Even I forget the details from the book, I can tell there're too many strange things happened on the screen. Actually, I'm glad that this vampire movie didn't turn out to be something like Twilight Saga. Argh, those romance things ruin the vampire pride. But there is one in this movie,and it does hurt me (Hey, I wanna see Debby). Mr. Shan, stop them for adding the unnecessary romance scene. Just found out, Chris Massoglia in Medical Investigation. Sama kayak Percy Jackson, harusnya juga bocah 12 tahun, tapi yg dipake 18 tahun. Kemaren gue liat dvdnya dan berniat untuk beli, tapi gak jadi. jadi temennya Darren, tapi jalan ceritanya ngaco deh.. harusnya steve muncul lagi di buku ke berapa... gitu... bukan di awal2 gini. baca dulu dah novelnya.